Would like to know what’s changed. Is there a change log this time? I know a huge complaint last time was there was none. I am not with the direct Writer team so I do not have a change list. I worked on Windows Photo Gallery and the Microsoft Camera Codec Pack after the release of Writer 2011. Windows Live in general does not publish change lists for major releases like Windows Essentials 2012. Blog posts on the official Windows Live Blog will highlight new features for applications. To date there have been articles on Photo Gallery, Movie Maker, and Sky Drive. Love the Windows Essentials programs, here is an update to 2012 version. Sorry no change log yet… I hope one comes out. See my reply in your other comment. Windows Live generally does not comment on changes for major releases such as 2012. Blog posts on the offical Windows Live blog have been highlighting new features in parts of the Windows Essentails 2012 suite. Aaron, what exactly has been changed in this version of Writer and also I’m disappointed that you guys haven’t added Vimeo to Writer as well for the insert video feature. I had asked for Vimeo to be added ages ago. I’d also like to see Writer work with Tumblr at least (not sure how popular Posterous is these days) I know that most of you Writer bods were (borrowed) 😉 by the Photo Gallery team seeing as its always you lot who get the brilliant ideas for new features. I’d like Writer to also be able to add more frames to a photo, more effects (to mimic Instagram etc) and a larger choice perhaps of where to store your photos (though I like that SkyDrive is the de facto here, but maybe Flickr etc in other words, same as Photo Gallery. Looking forward guys to the Writer app once you’ve sorted it, just keeping my fingers crossed that you are all beavering away on one! Technogran, after Writer 2011 I moved over to lead the test team on Windows Photo Gallery and the Microsoft Camera Codec Pack so I am less in the know as to the work done for Writer for 2012. My observations in using Writer 2012 is that work was done to have Writer work better with Windows 8 and IE10. For what I want to do which is primarily to post to WordPress it does everything I want. There is no reason someone could not write a plug-in to post to Tumblr, one exists today to do this for posting to Posterous. The same thing can be said for Vimeo. None of the Writer team from 2011 except for me went to PG for 2012. For feature requests I encourage you and anyone else to leave feedback on the offical Windows Live blog. Additionally, there is a way to give feedback on app in the Windows 8 store. Thanks Aaron for your prompt reply. I do leave feedback on Writer as I am a Windows Live MVP, and yes, I know you were moved to PG. Keep up the good work and give my regards to the Writer team. 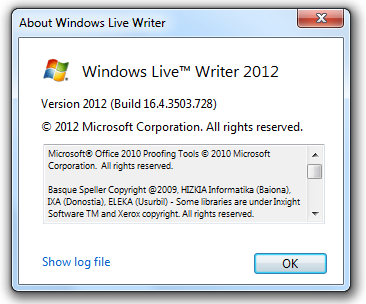 Windows Live Writer is not working with Blogger since yesterday for some reason. Any ideas?